The three-story, 143,000-square-foot facility accommodates the increasing use of technology in teaching and research. It also provides expansion space for the College’s growing collection of printed materials to support evolving curriculum needs. The library is architecturally consistent with the other buildings on the historic front quadrangle in both its materials—limestone, granite and marble—and its scale. The project reconfigures a composition of existing roadways, buildings and prominent public spaces, establishing a new campus center that fits into existing view corridors and pedestrian circulation routes. Library interiors provide efficient and flexible space that will serve the College’s needs well into the next century. This includes increased seating to accommodate planned growth in the student body. Because of the importance of interactive and collaborative learning in the residential liberal arts environment, most seating is in group study and meeting rooms. 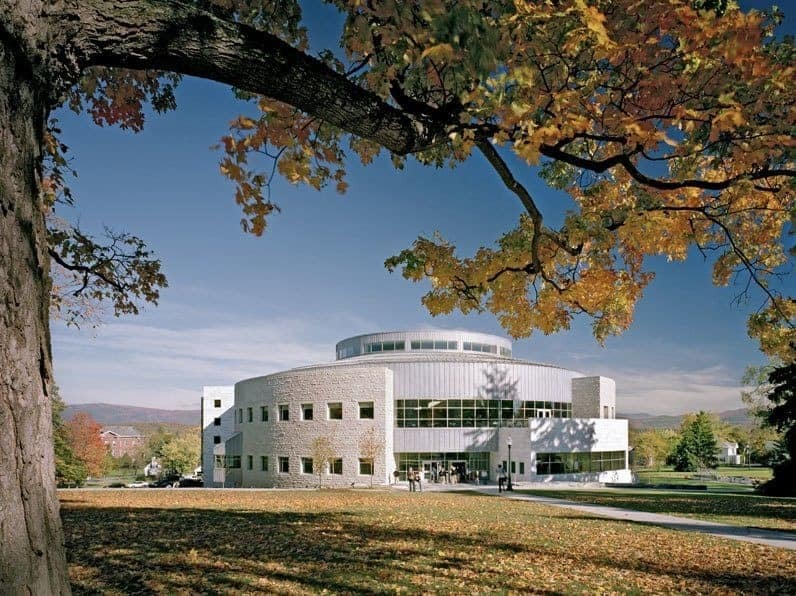 In keeping with Middlebury College’s overall concern for contextual and environmentally sensitive design, the project is designed to meet a high rating for the LEED (Leadership in Energy and Environmental Design) standard for environmental efficiency.